- I took this picture around 1979. The IMF was located in the Weapons Storage Area (part of the original East Loring), and was used in the 1970's for Short Range Attack Missile (SRAM) maintenance. 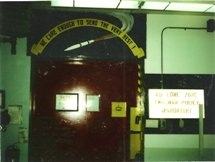 The door pictured was a blast door and was used to gain entrance to the maintenance bays...I do not know who painted the missile above the door, so maybe someone can tell me.